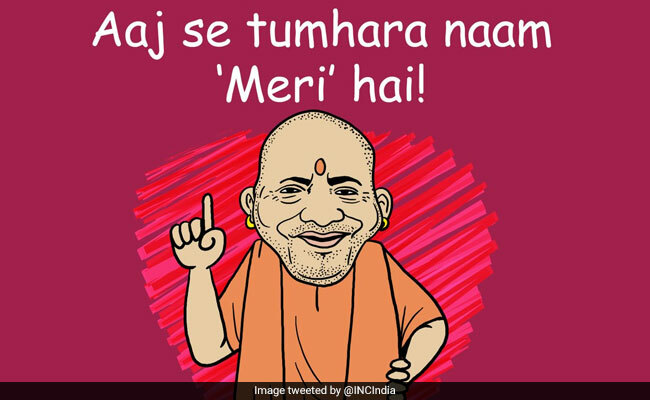 Valentine's Day 2019: The Congress shared cheeky memes on PM Modi and other top BJP leaders. Valentine's Day 2019: Congress jabbed Yogi Adityanath for his name-changing spree. On Valentine's Day, the Congress's social media team worked overtime to shred the BJP meme by meme. The party shared caricatures of Prime Minister Narendra Modi, top BJP leaders and ministers and targeted each of them on a different issue. For PM Modi, the party chose Rahul Gandhi's "chowkidar (gatekeeper)" jibe. The series, hash-tagged #LoveNotHate, also seems to have taken party chief Rahul Gandhi's thoughts on hugs with all seriousness. Every tweet is accompanied a hug emoji. For Defence Minister Nirmala Sitharaman, the meme reads: "The Silencer: You say it best, when you say nothing at all!" The Congress jabbed Uttar Pradesh Chief Minister Yogi Adityanath for his name-changing spree in the state. "Are you a semi-high speed train? Coz in my head you're moving at 2x speed," the meme on Railway Minister Piyush Goyal reads, days after he was roasted for posting a video of Vande Bharat Express, India's fastest train, which the Congress says was in fast forward mode. The party took a swipe at Union Minister Smriti Irani over the row in the past over her educational qualification. On Tuesday, which was celebrated as Hug Day, the Congress took a swipe at the BJP with a video of the famous video of Rahul Gandhi hugging PM Modi during the monsoon session of parliament last July. "Today our message to the #BJP is simple: Hug, don't hate," the Congress posted on Instagram.